Africa’s ports have made huge progress in recent years, with massive benefits being reaped through successful port management partnerships. African governments are increasingly moving towards a build, operate, transfer (BOT) model of port development, assuming more of a landlord role and allowing international port operators to shoulder the costs of construction in exchange for profit in the initial years of operation before they assume control. For the first time in its history, West Africa’s ports will be constructed and operated utilizing the latest equipment, processes and automation strategies, which will make them as competitive as any in the world. With several multi-billion dollar projects already underway and more in the pipeline alongside few smaller development initiatives, Africa is well-positioned to carve out for itself a larger share of the regional and wider shipping markets. Some of the ongoing projects placing Africa a notch higher with other continents include; phase two Mombasa port expansion in Kenya which was secured at a cost of US $346m and is set to provide an additional capacity of 450,000 Twenty-Foot Equivalent Units (TEUs). Tanzania has not been left behind as construction of Bagamoyo port worth US $10bn is already underway. Other developing projects include; construction of Lekki Deep Sea Port in Lagos,Nigeria expected to be finalized at a cost of US $1.5bn, and demand for containers is expected to grow at a CAGR of 12.9% up to 2025,Walvis Bay port expansion in Namibia will have a minimum capacity of 750,000 TEU’s per annum compared to the current 350,000 TEU’s per annum and lastly South Africa’s Durban port upgrade and expansion which aims to increase the capacity of the terminalto2.4-milliontwenty-foot equivalent units (TEUs). The port of Beira in Mozambique is expected to be a multi-purpose and container terminal covering 645 metres of berth length with a depth alongside of 12 metres. The terminal a design capacity is 100,000 TEUs per year. The Suez Canal Container Terminal in Egypt, a first Egyptian port features 12 super post Panamax cranes handling 700,000TEUs the quay wall extends to 1,200m and the terminal has an accommodation space for 47,500 including 976 allocated reefer slots. Globally, ports are gateways for 80% of merchandise trade by volume and 70% by value. Investment in ports and their related transport infrastructure to advance trade and promote overall economic development and growth is therefore vital particularly in emerging African economies that are currently under-served by modern transportation facilities. Port performance must be seen in the context of not only port infrastructure shortfalls, but also the fact that port performance has a direct impact on the efficiency and reliability of the entire transport network in which the port is just a node for the transfer of goods. Africa is endowed with vast resources and a growing population, a 25% improvement in port performance could increase GDP by 2%, demonstrating the close relationship between port effectiveness and trade competitiveness. With growing congestion in many African ports, the continent runs the risk of sacrificing further growth through lack of investment in port terminal infrastructure. Access to effective ports, interconnecting infrastructure and efficient operations to cope with current demand and future growth, will lead to reduced costs and improved overall freight logistics efficiency and reliability , all of which are fundamental to the region’s future success. Trade competitiveness requires governments and key stakeholders to see ports as facilitators of trade and integrators in the logistics supply chain. 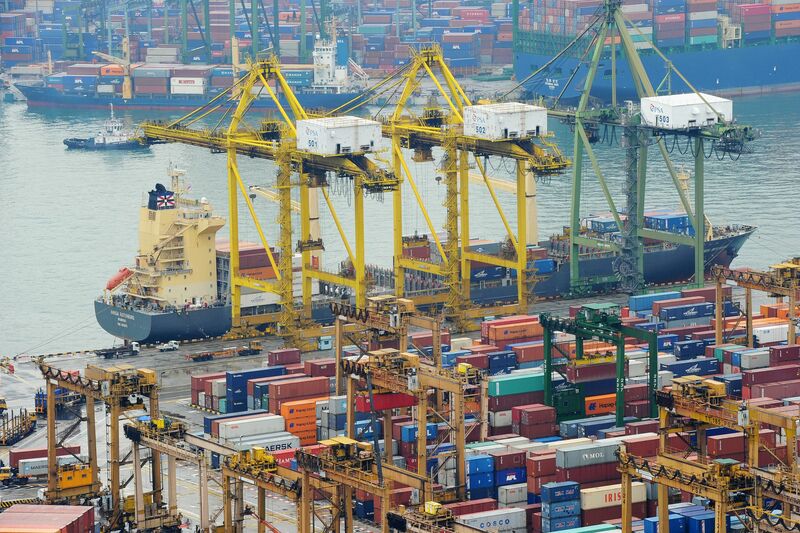 Efficient ports can make countries and regions more competitive and thus improve their growth prospects. The reliability and efficiency of each port terminal, including minimizing delay to shippers, is critical to enhancing future trade facilitation. Kenya and Tanzania is expected to a be a major transshipment hub on the East Coast of Africa, which will reduce freight costs in addition to contributing to the Belt and Road.-collection of interlinking trade deals and infrastructure projects. Port operations in Mombasa and Dar es Salaam are critical to increased throughput and evacuation of cargo. Investments in rail are seen as a major step towards contributing to improved performance. Developments in multimodal operations and master planning of the ports to keep up to date with increasing throughput, which in turn fuels economic growth are critical to efficiency. In West Africa as economies embark upon, or seek to accelerate, the implementation of their economic development drives, new and expanded port access and capabilities are increasingly recognized as key tenets of these programs. This is exemplified by the number of active port development and expansion projects in Nigeria and Ghana. Historically, many governments have focused on the revenues that can be extracted from ports as opposed to recognizing them as facilitators of trade and growth. Africa needs to shift its understanding of the role ports can play and step up investment in them to achieve its economic development goals. In particular, there should be more awareness of the greater economic benefits that effective and efficient ports can play. The business case for port expansion is often only defined once capacity is already constrained and thus many operate under severe pressure while investment decisions are being made. This continual lag, which often lasts years, reduces competiveness and takes no account of the resulting reduced trade impact on African economies. In contrast, China’s approach to port investment is instructive. China considers port investments on the benefits it receives from trade and thus regards ports as highly strategic investments in the national interest. High port logistics costs, poor reliability and low economies of scale in trade volumes have a negative impact on trade growth in Africa. According to PwC estimates, US $2.2bn per annum could be saved in costs if the average throughput at the major ports in Africa doubled. In other parts of the world, such a focus on volume and efficiency has led to a stronger emphasis on hub and feeder ports for containers and enhancing scale for commodity bulk terminals. It is likely that we will see some ports eventually emerge as major hubs. PwC’s analysis shows that, based on the degree of shipping liner connectivity, amount of trade passing through a port, and the size of the hinterland, Durban (South Africa), Abidjan (Côte d’Ivoire) and Mombasa (Kenya) are most likely to emerge as the major hubs in Southern Africa, West Africa and East Africa, respectively. The fact that most African countries have an imbalance in trade focused on commodity exports and manufactured imports pose major cost challenges, imports are predominated by containerized cargo, while exports are mostly handled as bulk freight. Improving Africa’s trade potential to export manufactured, semi-processed or agricultural goods would significantly improve the imbalance in containerized trade. This rebalancing of containerized trade offers a unique opportunity for African countries to beneficiate and expands trade in higher-value exports. Info graphic showing Africa’s top 10Ports based in not only on through put but also on improvements and investment plans. Tanzania US $11 bn. Set to be the largest port in Africa handling 20 million containers per year. Expected to provide an additional capacity of 450,000 TEUs. Durban Port South Africa US$2.4 m Set to creating more container handling facilities including a second container terminal. Port of Beira Mozambique Expected to be a multi-purpose and container terminal covering 645 metres of berth length with a depth alongside of 12 metres. The terminal a design capacity is 100,000 TEUs per year. Port of Richards Bay, South Africa US $140 m A new berth (207) will be dedicated to gas-to-power and bulk services will be provided for this berth. Uganda US $3bn The port construction that will be in three phases, with final master preliminary design set by July 15, 2018. Lekki Deep seaport Port Nigeria US $1.5 bn Stated to be completed in 2019, The port will have three container berths equipped to handle more than 1.8 million TEUs, one berth for dry bulk and two berths for liquid cargo.